When Muslims outside Pakistan are subject to mistreatment, Islamists in Pakistan typically react with passion. They hold protests and are known to attack non-Muslims. For example, following the demolition of the Babri mosque and violence against Muslims in India, Hindus and their temples were attacked all over Pakistan. Similarly, Islamists in Pakistan regularly call for jihad against the United States and the West, and hold them responsible for Muslim suffering, ignoring the fact that Muslims enjoy equal rights in Western countries. 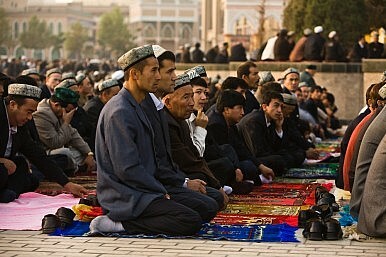 In contrast, with ties between China and Pakistan strengthening by the day, Islamists have stayed quiet on the tension and discord between the Chinese authorities and the indigenous Uighur Muslims, who live mostly in China’s Xinjiang Province, including Beijing’s decision to ban Ramadan fasting in Xinjiang. China and Pakistan have enjoyed amicable relations for decades, and Islamists do not want to earn the ire of Pakistan’s establishment. Indeed, the statements attributed by the Indian media to Saeed were not reported in the mainstream Pakistani media. But Pakistan-based analysts say that while Islamists may be reluctant to speak up publicly against China, they are definitely unhappy about the ill-treatment of Muslims in Xinjiang. Still, for as long as China-Pakistan ties are positive, Islamists in Pakistan do not dare stand up to China publicly. Nor are they willing to criticize China for Muslim suffering in Xijiang at the hands of the Chinese authorities. This quiet discontent may be manageable – for now at least – but Pakistan has another worry in its relations with China: attacks on Chinese nationals in Pakistan. On May 30, 2016, a Chinese engineer survived a bomb attack in Karachi, Pakistan. Senior Superintendent of Police Rao Anwar told journalists that a pamphlet written in Sindhi and bearing the name of a group called Sindhudesh Revolutionary Party was recovered from the site of the blast. The pamphlet, written in Sindhi, called China a “rising imperialist power” and a “collaborator of the Punjabi Establishment” in enslaving the Sindh province and looting its resources. It claimed responsibility for the attack. It further read: “We want to make it clear to China that we will oppose every anti-Sindh project including the China-Pakistan Economic Corridor (CPEC).” In recent weeks, Sindhi nationalists also held rallies in Interior Sindh in opposition to the CPEC. Sindh hosts more Chinese nationals than any other province of Pakistan. This was the first attack on a Chinese engineer in the province. It comes after what some analysts are calling a renewed energy in Sindhi ethnic politics in their opposition to CPEC. The attack has alarmed the Pakistani authorities, who considered Sindh safe for Chinese investment. The local government has reportedly hired 160 ex-servicemen as part of the Sindh police’s plan to raise a 2,000-strong commando force to provide security for Chinese working in the province on development projects, including those related to the CPEC. Speaking with The Diplomat, a government official said the Sindh apex committee decided months ago to raise the security force, and that it was not prompted by the attack on the Chinese engineer. Since the announcement of the $46 billion China-Pakistan economic corridor, the number of Chinese nationals working in Pakistan has risen, particularly in Karachi. To protect them, Pakistani authorities are creating special forces in both Sindh and Balochistan. The prime suspect of the Mumbai attacks can now personally spearhead the Islamist campaign for parliament.